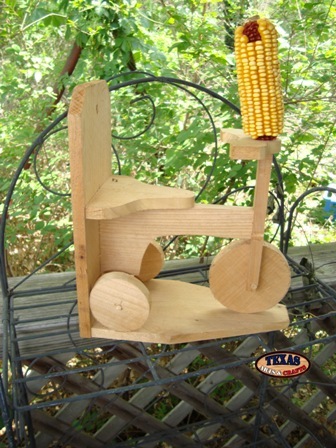 We hand make the Tricycle Squirrel Feeder in our workshop out of cedar. The squirrel feeder is in the shape of a tricycle. You can place the feeder on a nearby tree branch. Then you watch the squirrels sit on the feeder and eat the corn cob. The dimensions are 16 inches tall by 6 inches wide by 11 inches deep. The Squirrel Feeder weighs approximately 5 pounds with packaging. For the continental U.S. shipping and handling is included in the listed price.